Retailers and shippers are bracing for further shipment delays after the apparent resolution of a months-long labor dispute. A tentative labor agreement involving 29 ports was announced late on Friday involving 20,000 dockworkers. Tensions over their lack of a contract since July had led to chronic cargo backups. But port officials and companies warned it will take time to restore a normal flow of traffic. The port slowdown has rippled through the U.S. economy including the retail, auto and agriculture sectors. 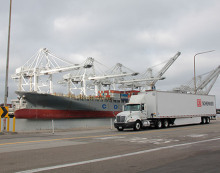 Port officials have informed retailers it will take 45 to 60 days to clear out the backlog, said Jonathan Gold, vice president of supply chain and customs policy at the National Retail Federation trade group. “It’s going to take time to get through all that and get to a normal rotation,” Gold said. “It could still mean there will be a delay in getting merchandise to the store shelves,” Gold said, including seasonal items such as spring or Easter apparel and footwear, and patio furniture. Lowe’s Companies Inc (LOW.N) uses most of the cargo gateways in the United States and plans to continue contingency routes “until we feel the congestion has eased on the West Coast,” spokesman Steve Salazar said in an email. Perry Ellis International Inc (PERY.O) said last week in its preliminary fourth-quarter results last week that it was unable to fill $23 million in sales orders because of late receipt of goods in fiscal 2015 resulting from port delays. In comments before Friday’s labor agreement, the apparel company said it anticipated “potential continued disruption in shipments and higher costs associated with continued port delays.” A spokeswoman for Perry Ellis on Monday declined to comment further. U.S. Secretary of Labor Thomas Perez, who arrived in San Francisco last week to help broker a labor deal, said on CNBC Monday that 25 people representing the union at the negotiating table unanimously agreed to the settlement, signaling likely adoption by longshore workers. DB Schenker is the world's leading global logistics provider, delivering over 140 years of premium performance and transportation solutions. One call gets our customers on the fast track to nearly 2,000 locations in all of the world's most important economic regions.